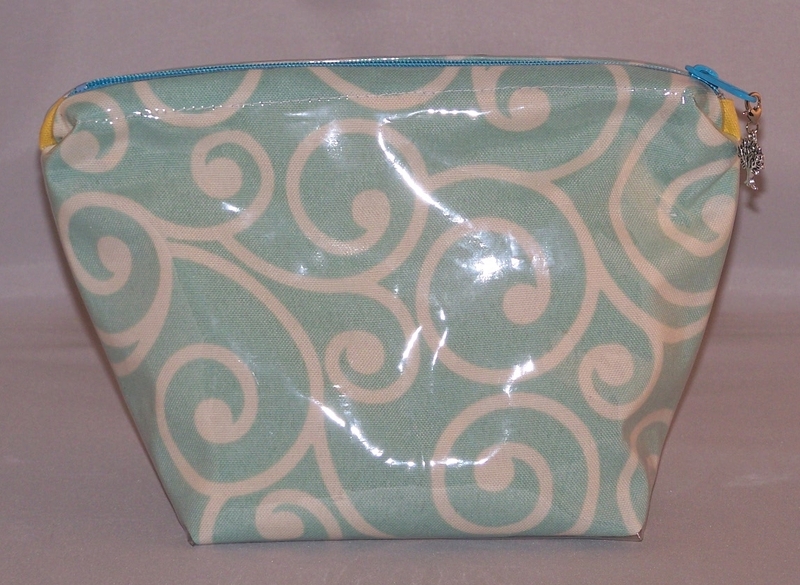 This is a quick and easy cosmetic bag tutorial using two types of vinyl products! I’ve experimented with the clear plastic vinyl and the Heat bond fusible vinyl, which produced different results when used separately. Using only the clear plastic vinyl produced a bulky bag that was tough to handle. 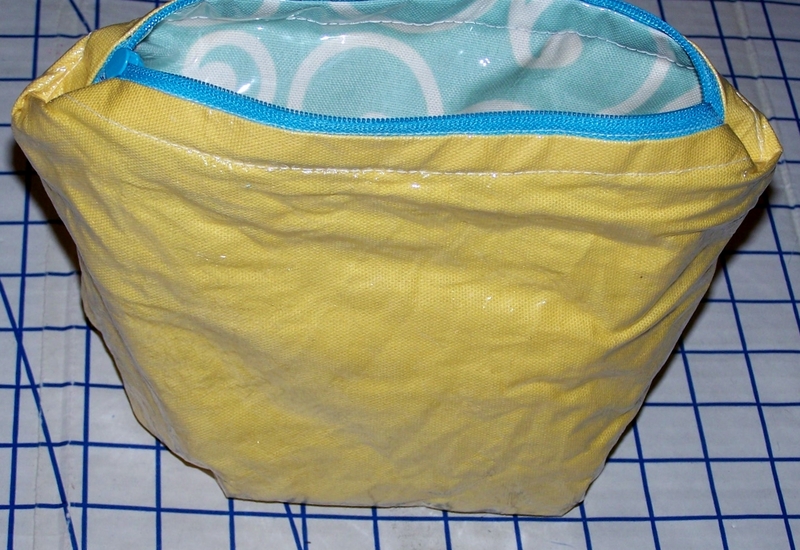 When I used the Heat bond fusible vinyl the bag lacked the firmness I desired. So when I decided to mix the vinyl products the results were marvelous! 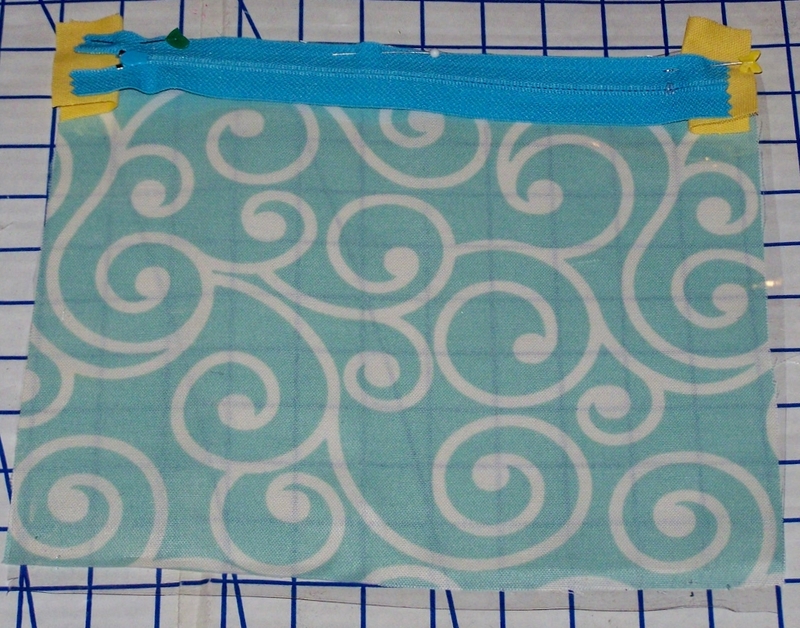 I got the firmness , and the ease of handling the bag while sewing. 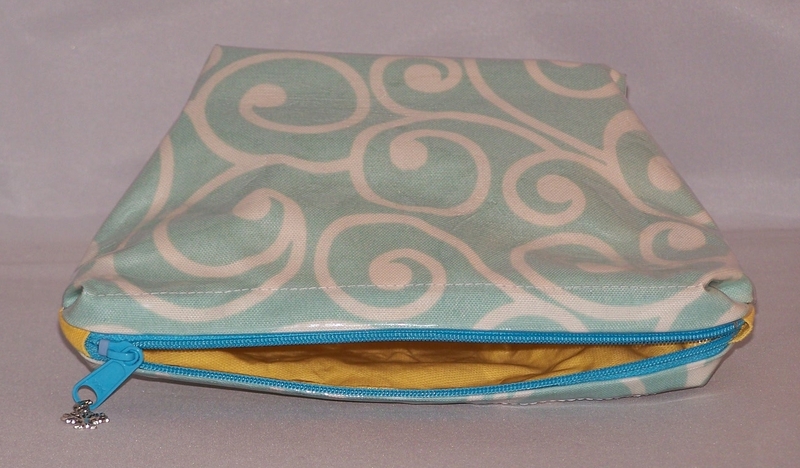 So let’s get ready to make a colorful cosmetic bag! Using a clear plastic vinyl outside, and fusible vinyl inside will make your cosmetic bag nearly waterproof and super easy to clean. Cutout the fabric panels and vinyl. Attach the Heat bond vinyl to the front of the contrasting fabric following the manufacturing instructions. 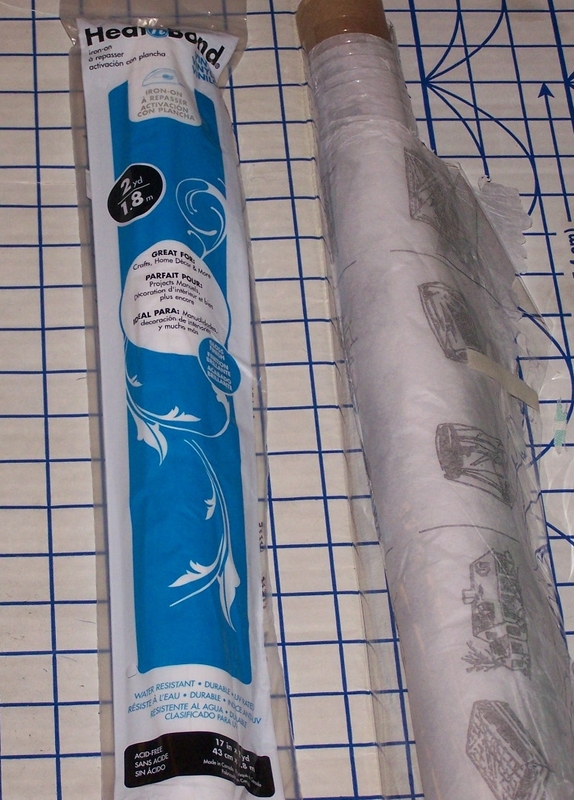 Place the clear (plastic) vinyl on top of the main fabric panel, and center the zipper face down at the top of the panel. 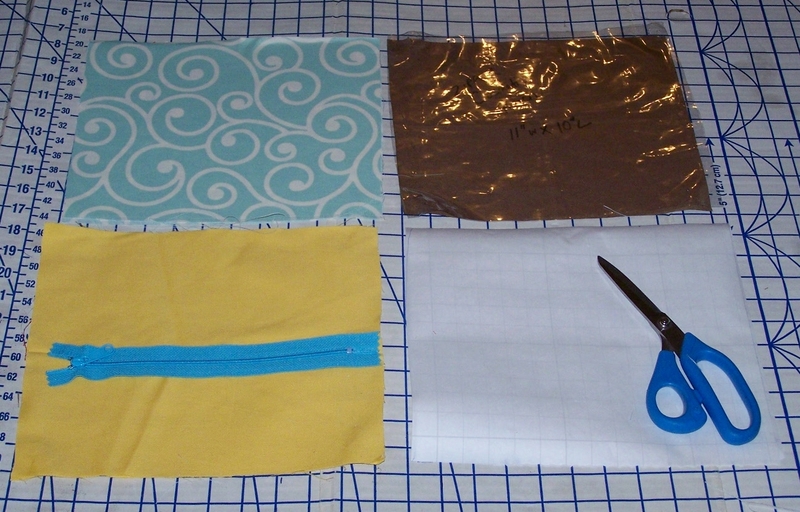 Fold each tab and place under the zipper matching the raw edges on the left and right sides of the panel. Sew along the top edge of the zipper attaching the tabs and vinyl. Place the contrasting fabric panel face down on top of the front fabric panel and the zipper. 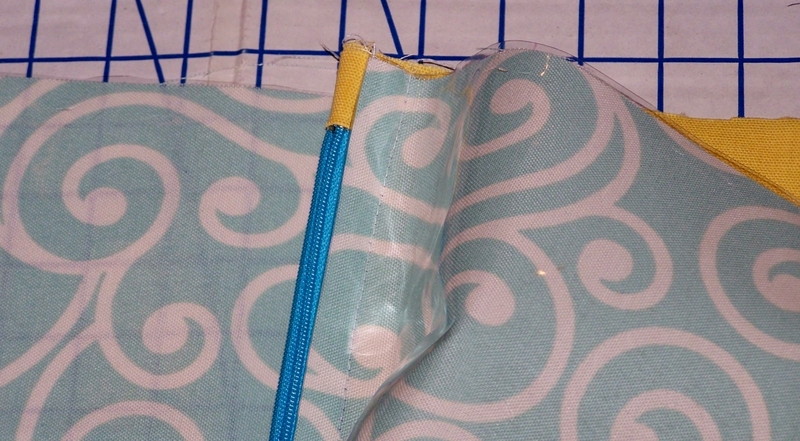 With the right sides together sew along the top of the panel along the existing zipper seam. 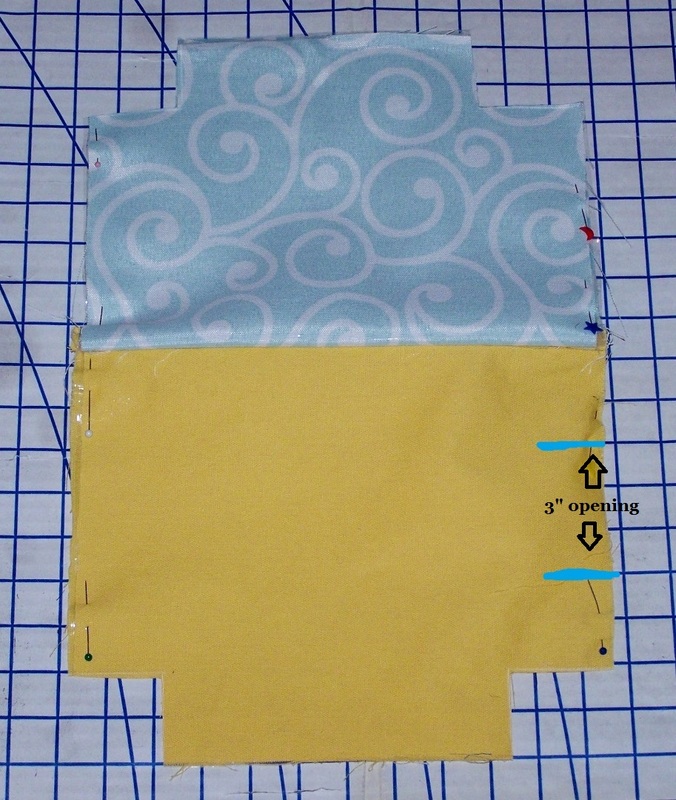 Repeat this step to attach the panels on the opposite side of the zipper. Lightly iron the fabric to flatten the seams on the side where the Heat bond vinyl was applied using the same paper removed during application. 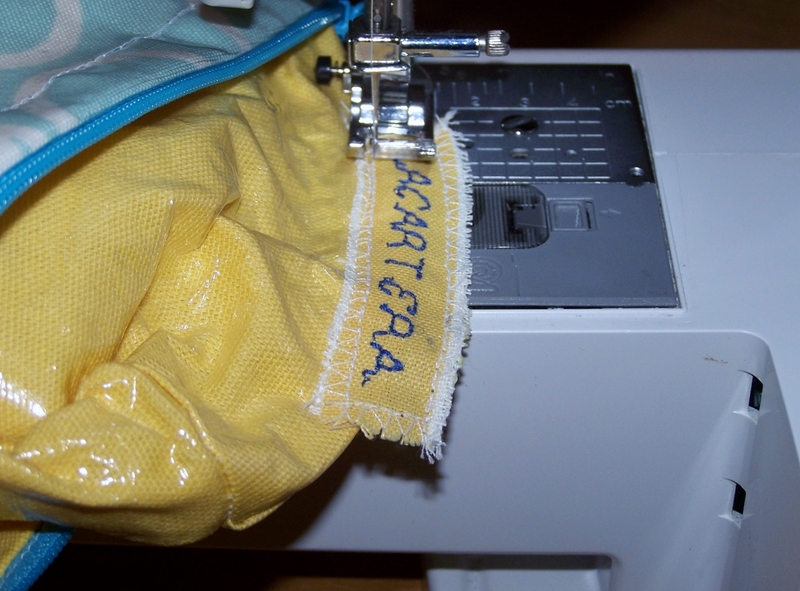 Sew a seam along the outer edge of the zipper, attaching the top and inside panel. 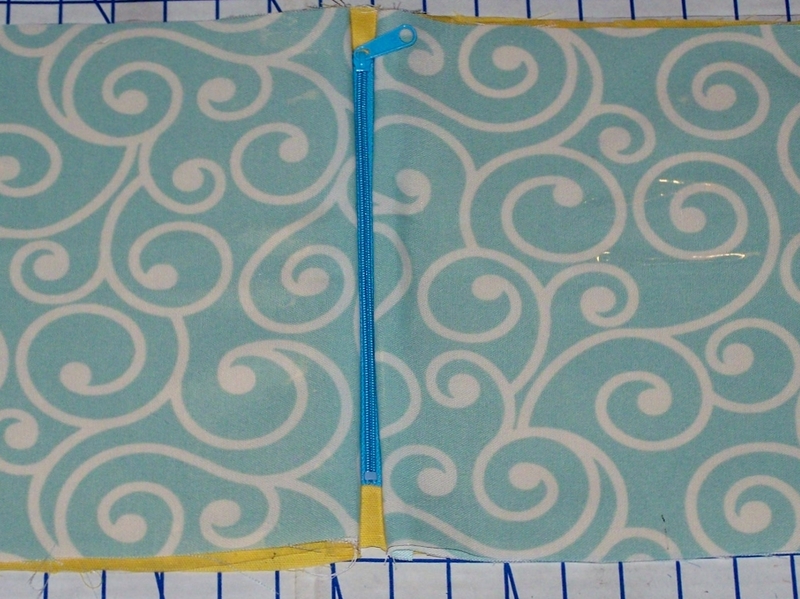 Match the front and back panels with front sides together, and match the inside panels together. Cut 2″ inch x 2″ inch squares on each corner. Open the zipper and make sure the zipper teeth are facing the bottom of the front panels. 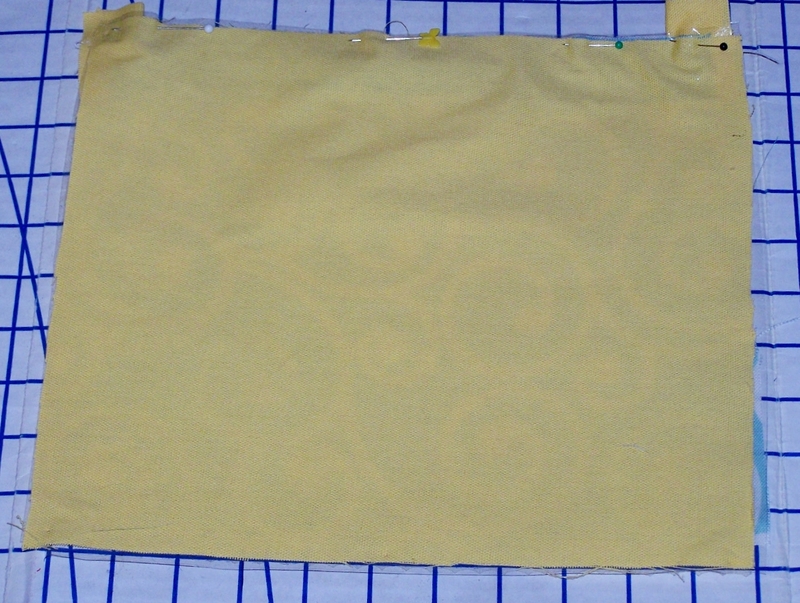 Sew 1/4″ seam along the sides and bottom. Leave a 3″ opening on one side of the inside panel. Double stitch above and below the opening. 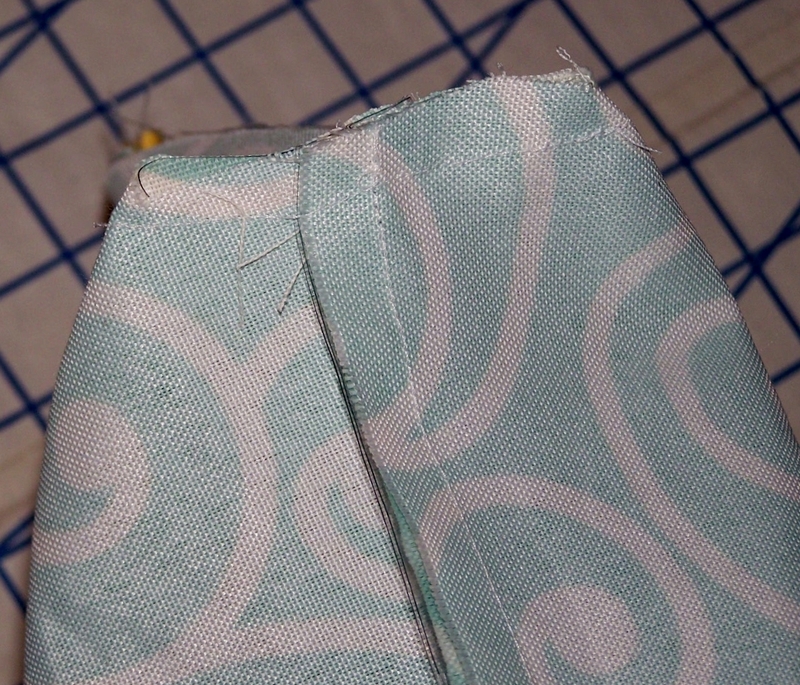 Match the openings of each corner, and sew a 1/4″ seam along the edge to create a square bottom. Turn the bag to its right side, pulling it through the opening. Take it slowly especially on the side with the Heat bond so that you do not puncture or scratch the surface. 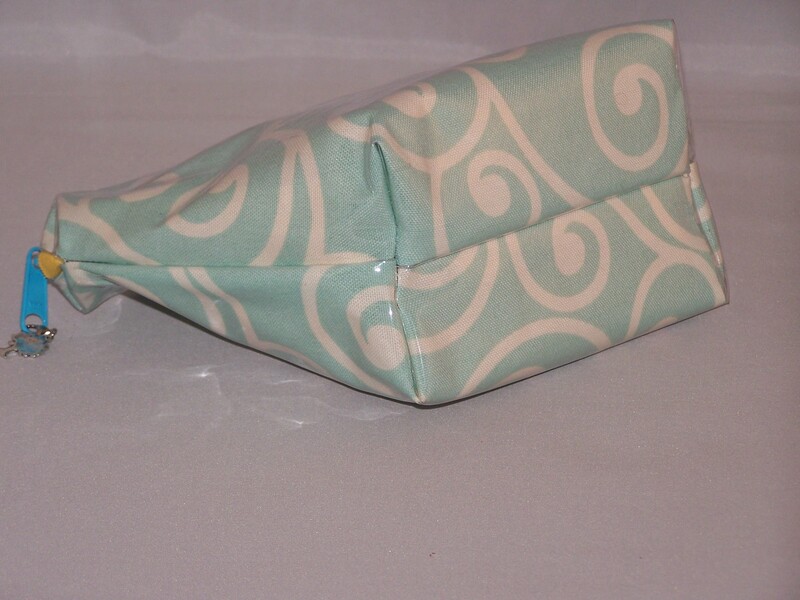 Sew the opening by folding the raw edges towards the inside. I’ve attached my tag along the opening. Next Post The Red Purse- Is it a Hit or Miss? Very nice! Would love to give this a go! Thank you! It’s super easy and a bit addictive too! 🙂 Please let me know when you give it try. 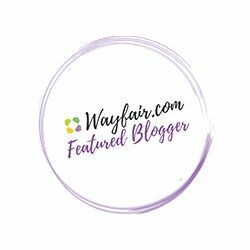 This beautiful creation is lovely and enjoyable to carry around, the tote is versatile and I love the matching cosmetic bag, which I sometimes use as a hand held wallet! 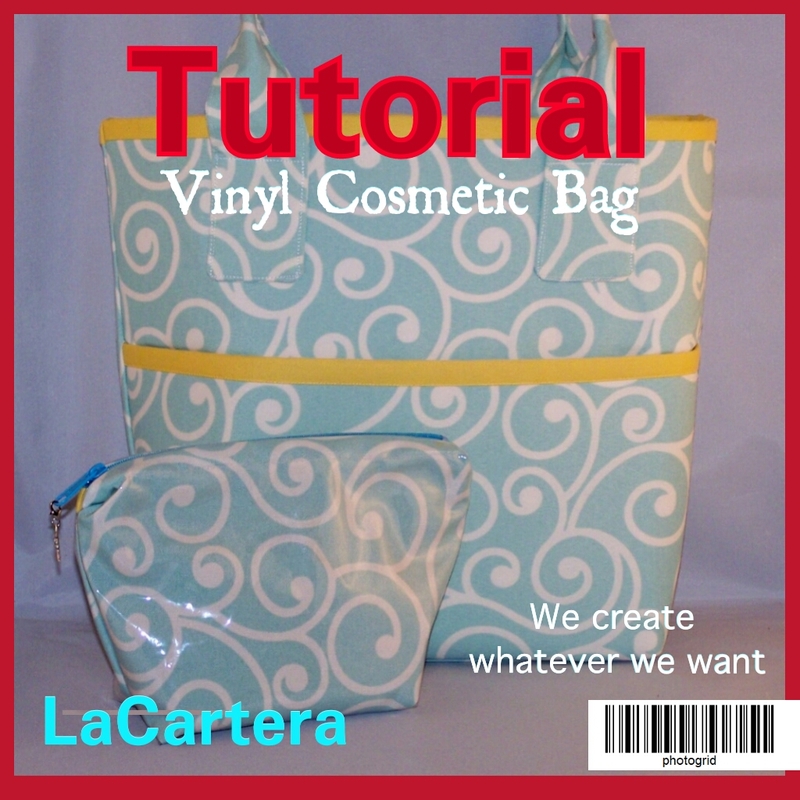 LaCatera listened to my design ideas, and created this tote to fit my needs, I love it!! Thank you Pam! I’m so glad you are happy with your custom order!